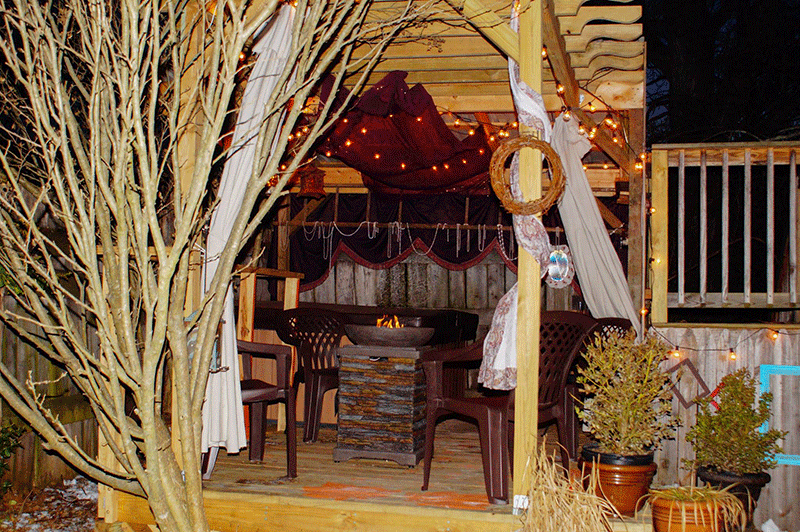 The Oasis Hot Tub Retreat at Oak Haven is a rejuvenating interlude in an often frantic world. Available to lodge guests and non-lodge guests! If you long for the luxurious feeling of a spa, the exhilaration and the peacefulness of a lush green garden-there’s no need to travel far. Come to the Oasis Hot Tub Retreat. If you pride yourself in finding new, delightful ways to entertain your friends and family – think of the Oasis Hot Tub Retreat. Far from the mundane, the Oasis is an entertainment alternative that returns you to your senses. The Oasis Hot Tub Retreat presents the calm, restorative effects of indulging in a hot tub combined with the visually soothing surroundings of a well-tended outdoor garden setting. What makes the Oasis such a luxury is the attention to detail, the cleanliness and the privacy. Each garden is a secluded place with robes and towels, shower, private entry and dressing room. For comfort, water is maintained at 102·° in autumn and winter and 96°-100° in spring and summer. ”Soaked last night, and it was a wonderfully relaxing, rejuvenating experience. A beautiful place — moon shining from above, the fire pit flames dancing, and the soothing water. Wow!” – Karen B. Please shower before and after using the hot tub. It is important to shower before using the hot tub to remove all body oils, hair spray/gel, perfumes, etc. as they will affect the chemistry of the water. It is important to shower after using the hot tub because some people are sensitive to the bromine in the water. Showering after tubbing will help reduce the chance of someone having a reaction to the bromine residue left on their skin upon getting out of the tub. Soapy showers are most effective in accomplishing these goals. Pregnant women are not advised to use hot tubs. Sitting in a hot tub causes blood to move to the skin’s surface in order to help regulate body temperature and release heat. The fetus is then deprived of an adequate blood supply as blood moves towards surface areas. Hot tubbing raises the body temperature of both the mother and the fetus. This is a problem because the fetus has no temperature regulating mechanism such as sweating like an adult. Elevated body temperatures in the first trimester have been found to result in neurological problems in newborns. Pregnant women can use the hot tubs if they have consulted their physicians and received approval or if they feel comfortable using the hot tub and getting in and out frequently to regulate their body temperature. Oils, body lotions, and minerals in the water are prohibited. Any of these substances will upset the delicate chemical balance of the water, possibly resulting in a less than ideal pH level or bromine level. They also may clog and damage our filters. The spa fragrances that we sell are specifically made for use in hot tubs and do not affect the pH or bromine levels, nor do they harm our filters. Always exit and enter the tubs slowly and cautiously. Wet feet, slippery tubs, and icy decks combine to make exiting and entering the tubs a potentially dangerous activity. 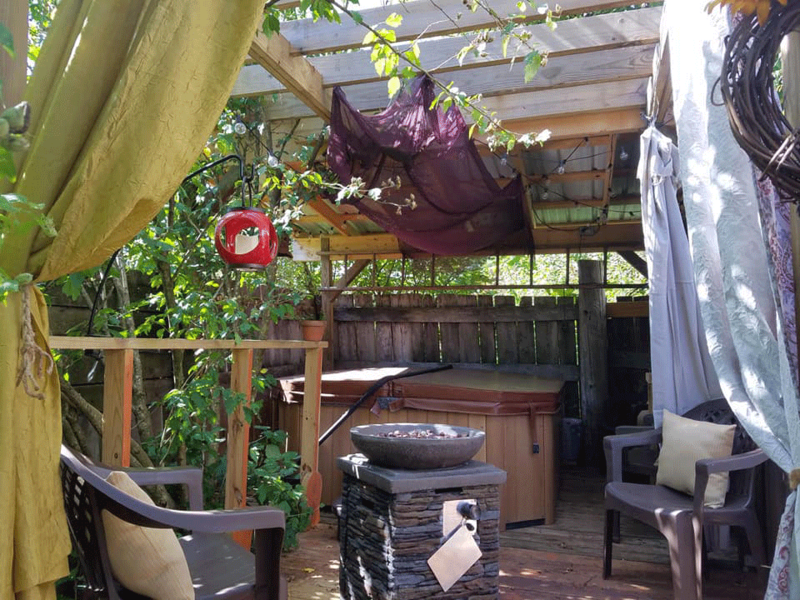 Guests are encouraged to move very carefully to and from their hot tub. Long exposure may result in nausea, dizziness, and fainting. These are symptoms of lowered blood pressure which may result from prolonged exposure. When blood pressure falls, less blood reaches the brain causing dizziness and fainting. Get in and out of the hot tub frequently to regulate body temperature. The consumption of alcohol is prohibited. The consumption of alcohol while hot tubbing is dangerous! Alcohol may dilate blood vessels and lower blood pressure. Dilated blood vessels in the stomach allow alcohol to enter the blood stream much faster than normal. Lowered blood pressure means the alcohol will be slower in exiting the blood stream. While hot tubbing, the effects of alcohol will be felt sooner and more intensely and last longer than under normal conditions. No glass bottles or containers are permitted. Glass may break and pose a serious danger on the deck and in the tub. Persons under 18 must be accompanied by a parent. We can allow people under 18 if we receive the consent of their parents/guardians. Please be careful, decks can be slick and/or icy. Guests are strongly encouraged to step slowly and carefully when moving to and from their hot tub. No candles or food allowed. Candles, rose petals and food items tend to create messes. An additional cleaning fee may be charged to anyone failing to follow these rules.